It’s been 30 years since the first published reports of what would come to be known as AIDS. 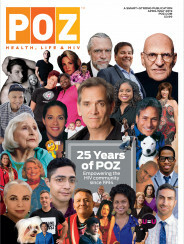 And Poz Magazine has decided to commemorate this by talking with 31 (one extra to grow on!) long-term survivors... I am over the moon to still be here, having been diagnosed in 1987 and likely infected quite a few years before. So of course I was also very happy to be one of the 31 to share some insight with Poz. Here’s a nugget from the interview... read the whole thing here. Check out all the interviews here. What one thing has most aided your survival, and how difficult is it to overcome stigma? Emotional support got me through the first 12 years of my HIV diagnosis. It’s what helped me survive the early years, before there were effective treatments. Today, my soul medicine comes in the form of my incredibly loving and understanding negatoid partner, Gwenn. We’ve shared a third of our lives together, and I’m looking forward to many more years with my best friend and lover--fortunately, they are one and the same! Well put, me. Can’t explain it any better than that.